Could there be more than one billionaire aboard SpaceX's upcoming lunar fly-around mission? SpaceX announced yesterday (Sept. 17) that the Japanese entrepreneur Yusaku Maezawa, who founded the e-commerce company Zozo, has purchased all of the seats aboard a BFR vehicle that will launch on a weeklong trek around the moon as early as 2023. 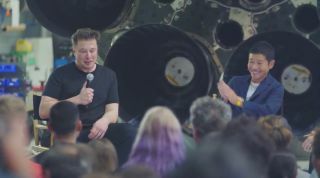 Toward the end of the event, a reporter in the room asked Musk about his own plans to fly in space. We probably shouldn't make too much of this playful exchange, but it is intriguing. Musk has previously expressed a desire to fly in space, though not on the earliest, riskiest missions. Indeed, one of his statements to this effect — "I'd like to die on Mars, just not on impact" — has found its way onto T-shirts and posters. "This has done a lot to restore my faith in humanity — that somebody's willing to do this," Musk said. "To take their money and help fund this new program that's risky, might not succeed [and] is dangerous. He's donating seats. These are great things." The BFR will stand about 387 feet (118 meters) tall, and both its rocket and spaceship components will be reusable. The 180-foot-long (55 m) spaceship can accommodate 100 people, but SpaceX wants to keep numbers way down on the lunar flyaround, Musk said. The company will use the extra space to store lots of food, water, fuel and spare parts, in case something goes wrong during the flight. And the 2023 date, by the way, is far from set in stone; a lot of development and testing work will have to go well for SpaceX to hit that target, Musk said. The BFR (which stands for "Big Falcon Rocket," or "Big F------ Rocket") is designed to help humanity settle Mars and other worlds throughout the solar system, Musk has said. And, if everything goes according to plan, it will also do a lot of other things, from satellite launches to "point-to-point" travel here on Earth. SpaceX aims to phase out all of its current hardware eventually, handing all tasks over to the BFR.